Persistent, white tracer smoke-- great for checking air flow patterns. The 15-080 Tel-Tru™ Dura-Puffer™ from E Vernon Hill produces puffs of "smoke" on demand for environmental air motion studies. The Dura-Puffer offers many of the features of both the classic T-T Smoke Stick and the T-T Smoke Gun combined in a reusable, unbreakable Teflon* dispenser body, which is virtually impervious to the smoke-producing compound, titanium tetrachloride. The Dura-Puffer body is 2-3/8" in diameter by 5-1/4" high and is filled with cotton. The replaceable screw-on plastic dispenser spouts add 1-3/8 inches to the height. With use, the plastic dispenser spouts will decay and must be replaced. Two are supplied with each Dura-Puffer kit. A flat Teflon* screw-on cap is also supplied for long-term storage of unused smoke between application. To use the Tel-Tru™ Dura-Puffer™, load the contents of a refill vial into the dispenser body and screw-on a dispenser spout. Titanium tetrachloride combines with atmospheric moisture to form dense, persistent smoke. 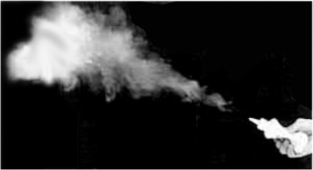 Smoke is emitted in discrete puffs or in a long stream - depending on how forcibly the dispenser body is squeezed. Each refill vial provides from 250 to 500 puffs of smoke. The #15-080 kit includes the Dura-Puffer, four refill vials, one storage cap, two dispenser spouts and instructions contained in a handy, high-impact, air-tight, polyethylene storage case. The 15-080 Tel-Tru™ Dura-Puffer™ is intended for use in air movement studies. The dense white smoke makes it ideal for this application. When exposed to moisture in the air, titanium tetrachloride reacts to form smoke containing small quantities of hydrochloric acid, titanium oxychloride and titanium oxides. Be aware of any problems that small quantities of these chemicals may cause in your specific application. Use only in a well-ventilated area. Avoid inhaling smoke. This information is provided as a guideline for the use of the T-T Dura-Puffer.